Green Lake County is a county located in the state of Wisconsin. Based on the 2010 census, the population was 19,051. Its county seat is Green Lake. Green Lake County was named for its principal body of water, a beautiful sheet of a distinctly emerald color. The lake was called by the French Lac Verd, which the early settlers translated into Green Lake - Hist. No. Wis., p. 349. See also Dart's narrative, post. "GREEN LAKE, lies immediately east of Puckawa; eight miles long, by two broad; its waters deep, and very clear. The bottom is covered with white pebbles and wild rice, or other vegetation, does not grow upon it, as upon most of the lakes about this portion of Wisconsin." Green Lake County has only existed since 1858 but its settlement started much earlier. Originally under the judicial jurisdiction of Brown County, the territory was established as Marquette County in 1836 and fully organized in 1848 with the county seat at Marquette. 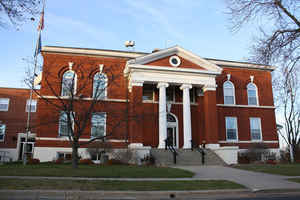 Green Lake County was separated from Marquette County by an Act of Legislation in 1858 with the county seat at Berlin. In 1862, the citizens voted to move the county seat to Dartford, (now known as Green Lake). In 1863 the first courthouse was built in Dartford at the present site. In 1866 dissension between the factions moved the county seat to Princeton with a early morning raid on the records. In the same year, the Supreme Court ordered the county seat back to Dartford. Later attempts were made to detach the western towns from Fond du Lac County to Green Lake County and make Ripon the county seat. Those efforts failed. Luther Gleason is credited with being the first to settle in the new territory near the village of Marquette on the Fox River, migrating from Vermont in 1831. He was an Indian trader and kept a store. James Powell settled in the town of Green Lake in 1835 or before. Hiram McDonald was the third settler in the County. He located in the town of Mackford in 1836. Anson Dart and his two sons located at the outlet of Twin Lakes in 1840 and put up the first frame house. In 1843 William Dakin and Satterlee Clark settled near the Center House. The first Post Office in the County was at Mr. Clark's. Mr. W.A. Millard was probably the first settler on the Village of Manchester site, arriving in 1846. In 1846, R. Day, J. Burt, Henry Pratt and others came to Little Green. In 1847 the county comprised three electoral precincts, Puckaway, Lake Marie and Big Green. In that same year Mr. Atkins put up a log cabin in the town of Berlin. In May of 1847 Nathan Strong entered the land on which part of the City of Berlin now stands. Joel Day erected the first frame house here in 1848. The settlement was originally called Strongsville. Also in 1847 Datus Lewis, J. Larkin and others commenced the Seventh Day Baptist settlement in the town of Berlin on the east side of the river and named the area Berlin after their former home in upstate New York. John Winchell built a log cabin in the town of Princeton in 1848. In July of 1848, Royal Treat purchased 132 acres and plotted out the city in 1849. It was originally called Treat's Landing. The Town of Brooklyn at first settlement was called Lexington. On its organization in January of 1849 the name was changed to Arcade and again changed to Brooklyn in the winter of 1850. The first settler in Seneca, Mr. Ayshford, arrived about 1850. The Village of Kingston organized in 1858 and Green Lake County is officially recognized. Green Lake County now consisted of the City of Berlin, the Town of Berlin, Town of Brooklyn, City of Green Lake, Town of Green Lake, Town of Kingston, Village of Kingston, Town of Mackford, Town of Manchester, City of Markesan, Town of Marquette, Village of Marquette, City of Princeton, Town of Princeton, Town of St. Marie, and Town of Seneca. As reported by the Census Bureau, the county has a total area of 380 square miles (985 km2), of which, 354 square miles (918 km2) of it is land and 26 square miles (68 km2) of it (6.87%) is water.